Your partner will not expect you to shower them with gifts every day. However, one thing to always do is let your partner know that you appreciate them by doing little things for them like allowing them to rest after a long day while you take care of the chores. Be sure to thank your partner for the little things as well like if they offer to take care of something that you were going to deal with. And even mention how grateful you are to them. Because if your partner feels taken for granted, then that will only lead to resentment which is a relationship-destroyer. If you do something that your partner does not approve of, the last thing you will want to do is hide it from them because the truth always becomes uncovered no matter what. Sure, your partner will be upset at first but will appreciate you after cooling down for being honest and upfront. Because lying in any relationship is never acceptable and that will end up leading to mistrust. That is also a relationship deal breaker. If you are extremely angry with your partner and your partner says something hurtful, then the best thing to do is to walk away and give your mate the silent treatment. This will only allow your partner to cool down and apologize to you later on. This also means you will be willing to apologize if you were in the wrong as well over something that you and your partner were fighting about. It will not matter if you meet your lifelong partner through our Shadi matchmaking site or elsewhere. You will need to expect that during your marriage will want different things even if you have a lot in common, and the best thing to do is to make compromises so you both are satisfied. Because if a compromise is not made and your partner ends up doing something that you were not in favor of or vice versa, then all that will do is lead to long term resentment. That is one thing you will want to avoid at all costs! To all of the members looking for their forever mates through our Shadi matchmaking site will now know what needs to be done when it comes to maximizing having successful marriages. 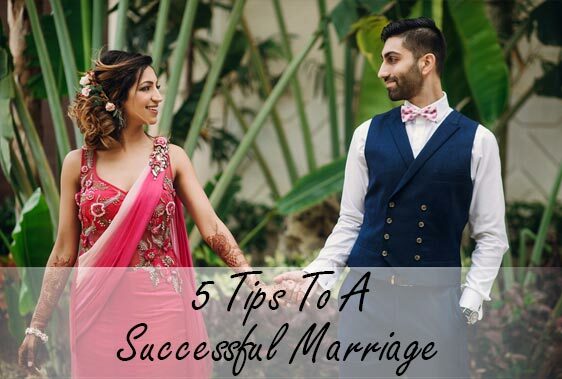 These 5 tips will help make that happen as long as they are followed at all times during the marriage!